Okay – we’re back (please read Part 1 if you haven’t already) . Let’s finish off with what those last two letters – A and D – represent when it comes to doing a Master’s degree or otherwise being part of the LEAD Lab team. Jens, Morgan and the whole LEAD Lab team are here for you when it comes to advice on everything from thesis topics to course selection to job opportunities. Team meetings often feature DesignFests – short presentations by any LEAD Lab member on a variety of topics. If you have pressing questions about your thesis work to date or some other issue around your Master’s process consider whether you can turn them into a DesignFest and present it to the group for their input or meet with Morgan or Jens one-on-one. This meaning of directing is not so much directing as in directions on a map – although there is some of that – but rather more like the directing as in the movies. I like this definition from Wikipedia and I think if you just substitute the words ‘successful Master’s degree’ for film and ‘you’ for the ‘cast and crew’ you’ll get what I’m talking about. “A film director is a person who directs the making of a film. A film director controls a film’s artistic and dramatic aspects and visualizes the screenplay (or script) while guiding the technical crew and actors in the fulfillment of that vision. In this analogy the ‘budget’ is the time and energy you have available to you for dedicating to your Master’s program and Jens and Morgan will help you stay within this ‘budget’ while also negotiating “differences in creative visions” and making sure that you accomplish (realize) the end result while staying true to your personal “artistic and dramatic aspects”. Maybe the analogy is a bit of a stretch but I think you can see what I am getting at. In closing I’ll just say that Jens and Morgan, as principals of the LEAD Lab, want to ‘direct’ Master’s students to help them succeed with as little stress and angst and as much learning and self-discovery as possible. And in fact, as I hope I’ve made clear with this post, all LEAD Lab members are rooting for each other – it’s what makes this small (but mighty) team such a great group to work and study with. Whether you’re new to LEAD Lab or returning after prior studies or employment with the Lab welcome – we’re glad to have you. This entry was posted in Graduate Students, Working with LEAD Lab and tagged Advice to students, course selection, Master's project, PhD, thesis on May 23, 2018 by Susan Martin. If you look at the LEAD Lab website you’ll see that LEAD is an acronym representing the words Learn, Engineer, Act and Design. But after nearly four months working here on a co-op work term I’ve come to realize that these letters could also stand for the following attributes that I’d like to share with you in the form of ‘advice to students’. (For a TL:DR version see the graphic below). This advice is mostly directed at those joining the lab to pursue a Master’s degree (with Dr. Jens Weber and/or Dr. Morgan Price as your supervisors) but could equally apply to those that are going for a PhD or joining in some other capacity – such as a work study student or someone pursuing an interdisciplinary studies course through Health Information Science. 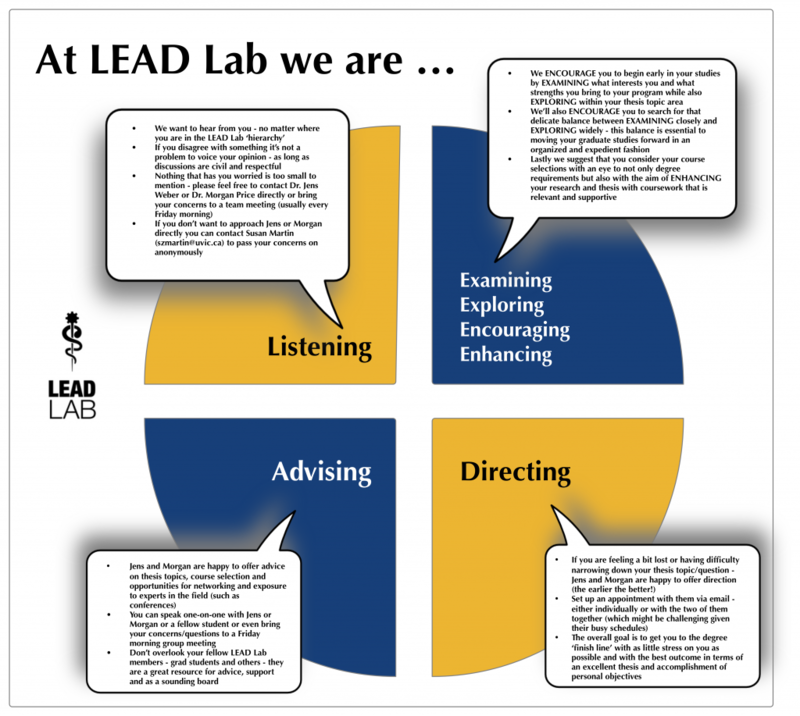 The people at LEAD Lab really believe in – and value – listening. They want to hear what you have to say and want you to feel free to say it no matter how small the matter seems or where in the lab’s hierarchy you are (or where you perceive yourself to be). On that note, Dr. Weber and Dr. Price both acknowledge that there is a hierarchy though not as rigid, as deep or as articulated as in other environments you might have encountered or worked in. For example, they are both fine with being Jens and Morgan and with you challenging them – respectfully and civilly of course – in discussion when you think there is a perspective they have overlooked or that you disagree with. And if you find, despite the informal atmosphere of the lab, that you do not want to approach Jens or Morgan directly with a concern or issue I have volunteered – at least until September 2018, to act as a kind of ombudsperson to take things forward anonymously to either or both of them. You can reach me via email at szmartin@uvic.ca and arrange to talk to me face-to-face at your convenience (if you wish) and with confidence that I will keep your identity secret. I know – that’s a lot of Es! Let’s take them one at a time. Actually the first two Es – examining and exploring – are an attempt to capture what Iryna Davies – a previous Master’s student supervised by Jens and now a PhD student at the University of British Columbia’s Experimental Medicine program supervised by Morgan – mentioned at a recent LEAD Lab Team Meeting. That is that when students transition from undergrad into a Master’s program, especially if they are on the younger side and may not have had extensive work or life experience, they can feel a bit lost. They go from an academic environment where there are firm deadlines, structured coursework and final exams looming at the end of the road to one littered with shiny, interesting topics and a confusing but enticing network of paths that one could follow on the way to a completed thesis. Jens and Morgan want to try to assist students to navigate this new environment by assisting them – through one-on-one discussion, email or through group back-and-forth at Team meetings (if appropriate) – to both examine the intersection of their individual interests and what could make a good thesis question/topic and to explore widely but within reason. The within reason part segues into the next E – encouraging. LEAD Lab wants to be a place that encourages students to find that balance between examining and exploring that allows them to stay on track with progress towards their eventual degree completion while still letting them learn about new avenues of interest and topics that they might want to return to post degree. The last E – enhancing – was brought to mind by the comments of Adeshina at our last LEAD Lab team meeting. Adeshina, who hails from Nigeria and has a B.Sc. in Computer Science from the University of Ibadan, is doing his Master’s at UVic while also working as both a Research Assistant for a LEAD Lab project with a local healthcare IT company and a Graduate Teaching Assistant for the department of Computer Science. He talked about his strategy of spreading out the necessary coursework for a Master’s over the full time of the program and enhancing his learning and thesis development by choosing courses that supported and strengthened his knowledge in topics relevant to his thesis. Adeshina also stressed the importance of having a carefully laid out plan for the entire time of your graduate studies with well-defined milestones that have been agreed upon by both the student and supervisor(s) – this helps to keep students on track and accountable for their progress and makes it easier to see early on if a student is getting into difficulty. This is getting pretty long so I’m going to suggest that we cover the letters A and D in Part 2 of this post.